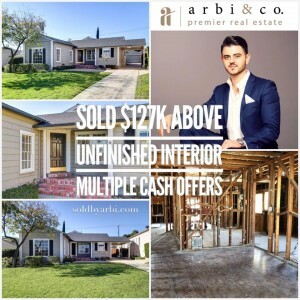 "I was introduced to Arbi through an associate to help me sell my place in Burbank. I had previously worked with another real estate agent but wasn't content with her soft, non-aggressive approach. In just 4 days, Arbi prepped my place, had his stager come out, and finally completed the photo session. When the property was on the MLS, we received a handful of offers, most of which were over MLS price, and eventually closed escrow. Arbi makes the process so seamless and easy. He's knowledgable, available, and very transparent. I would recommend him if you're looking to sell your place." "Arbi has been one of the most knowledgable agents that I have dealt with. He helped us sell our previous home in just one week with multiple offers over asking. He is an expert negotiator and will get you the deal right away. Arbi also helped with our current purchase as well. With his expert negotiating tactics, we were able to beat out the rest of the competition. He's a genuine down to earth person, so you can actually sit down and talk with the guy. We highly recommend Arbi to whom ever that is looking to purchasing or selling their property. He will get the job done right." "We needed to upsize and weren't sure how we would sell our home while at the same time have our offer accepted on the home of our dreams because we needed the proceeds of our current home as a part of the down payment for our new house. Arbi immediately came in and created a customized game plan that perfectly fit our timelines and needs. With his aggressive system of marketing, we received an offer on our property by highly qualified buyers which agreed to wait so that we can purchase and close escrow on our new home. Arbi was able to find the home of our dreams and had our offer accepted all within a reasonable timeframe. He was also able to carefully negotiate a substantial price reduction for minor issues and eventually closed escrow. If you want a real estate agent that gives it his all, rolls up his sleeves, and truly looks out for your best interest, Arbi is the one!! " "We entered the LA housing market as former residents of the Midwest. I looked at Yelp ratings and contacted Arbi Baghoomian, a realtor with 27 five-star reviews. He lived up to all the reviews, every designated star, and beyond. I feel so fortunate to have had Arbi as our realtor. The LA market is TRICKY and I don't know how we would have found our dream house without him. His mission is to make certain that his client is protected financially during the transaction and finds a home that meets all criteria. He is THE most responsive professional I have encountered with countless phone calls, texts, and emails. He is a patient, kind, and understanding businessman as well as a fierce negotiator. I now have a home that makes me smile in every room. Thank you so much, Arbi!" "I don't have anything to say about Arbi that hasn't already been said. He was very patient with my family and I as we worked through our own thought processes on buying a home - it took several months but he never gave up on us. He had great advice and really cared about the outcome. Through the end he answered all of our questions, delivered on-time, and was a joy to work with." "After just three weeks of having met Arbi for the first time, we had our house on the market and were choosing amongst multiple offers a couple of days after. Escrow came and went so seamlessly...plus, we were able to sell above the asking price. Arbi was quick and responsive to all of our questions and requests. There is no such thing as receiving special treatment from him because, well, he would make everyone feel like his special client! We couldn't be more thankful to the Sold by Arbi team for our super positive experience..."
"I had 3 real estate transactions with Arbi, first as a buyer and twice as a seller. During my first business transaction as a buyer, I experienced how fair and trustworthy Arbi was. In fact the trust between us was so amazing, we became close friends. So when i wanted to sell my first house, I decided to choose him as my realtor. I never regretted my decision. He sold my house well above and beyond my expectations. He and his team knew exactly how to advice me how to prepare the house to improve its saleability. When I planned to sell my 3rd house, I hired him again with the same satisfactory results. I definitely and highly recommend Arbi to anyone contemplating on selling a real estate property."